Brand new food truck in southeast Austin: Blue Ox Barbecue is in the courtyard of Buzz Mill Coffee, a brand new coffee house that will also be more than happy to pour you a beer or mix you a cocktail. 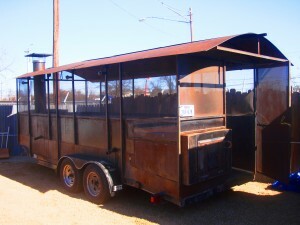 Blue Ox purchased a giant iron smoker off Aaron Franklin to serve as the heartbeat of their business. One imagines it has a few thousand pounds of meat patina ingrained on the grating. I spotted a big stack of well seasoned oak over in one corner of the courtyard to fuel the machine. Blue Ox is serving market style Central Texas barbecue with all meats being offered by the pound: brisket, sausage, pork ribs and pulled pork shoulder. They’re also doing a weekend-only all you can eat flapjack breakfast for $5. This entry was posted in Texas Barbecue, Texas Barbecue Photos and tagged Austin, blue ox barbecue, buzz mill coffee, chase palmer, texas. Bookmark the permalink.